Specialists in Rare Plants, servicing Dun Laoghaire, Dublin and Nationwide. Pots and containers offer new prospects to any garden design. Patios, decks, balconys and roof gardens where there is no ground to plant are ideal illustrations for them to be used. Some plants like specific soil types which can be replicated in the pot. If you want a pleasant rhododendron but your soil is limey you can grow it in a pot with lime free soil. Also plants can be used in a noticeable area when they are in colour and moved when their colour has gone over. 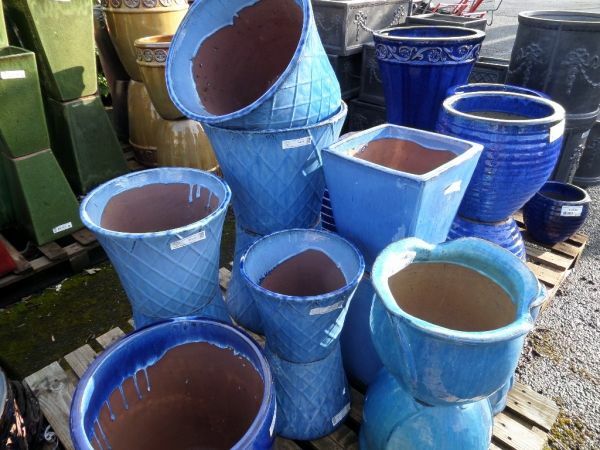 Murphy & Wood Garden Centre stock a huge variety of pots in numerous dimensions and elegances. Terracotta and glazed pots are still very common but also new materials like fibreclay. We are here to guide you on your pot selection. We also accept Laser & All Major Credit Cards.